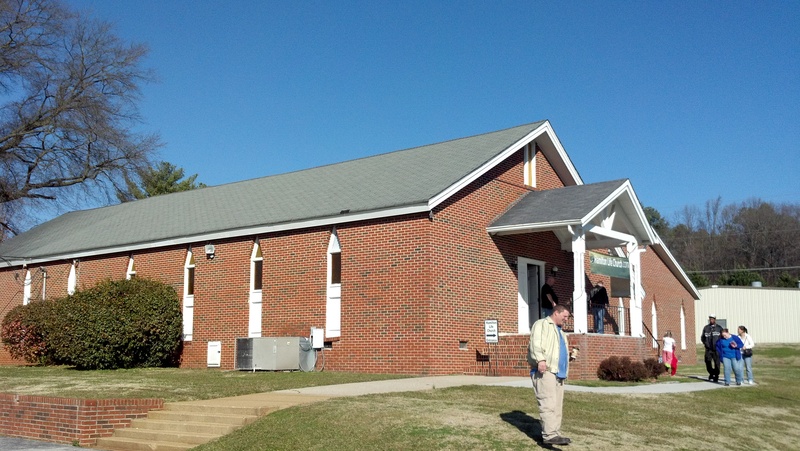 We arrived at Hamilton Life Church, which has found a home in a former Baptist church building on Cromwell Road after spending time meeting at the Wynnsong movie theater on Gunbarrel Road. As we strolled up to the building we were greeted by a couple of groups of people who were gathered in front of the church. They welcomed us, engaged us in a short conversation, and a very nice lady named Theresa did a fine job of introducing us to what we would soon come to realize is a common display of hospitality at Hamilton Life Church. We headed on inside the church and were immediately greeted by a couple named Guy and Beth. They were extremely friendly and welcoming, and we spent the next little while talking to them and Michael Picou, who had spotted us and joined in the conversation. Unfortunately, Kacey was sick so Michael came to church stag this week. We helped ourselves to some coffee and they gave us some insight on the history of the church and some of the remodeling they had done to the current building to create the front lobby, which allowed room for people to gather and fellowship, just as we were doing. Before the service began, one of the lead pastors, Damon Passons, came and introduced himself as well. We definitely enjoyed the warm atmosphere and good conversation, and as the time for the service to begin rapidly approached, we parted ways and went inside the sanctuary. The sanctuary showed signs of age, but appeared to have been cleaned and spruced up very well and had new cushioned chairs rather than the old-style wood pews you would expect in a building that used to be a small Baptist church. The place was decked out with Christmas decorations, including six small Christmas trees, plenty of tinsel, strings of lights, ornaments, and bows all around. This was a group that apparently favored quantity and a “homey” family atmosphere over the minimalistic, chic, high-end decorations that many churches opt for these days…I liked it. As the service began, a lady named Gail was invited to the front to share a poem that she had written, which I felt demonstrated that this church allowed their members to participate and be involved in the services. One of the things that has always bothered me about many churches I have attended is that it seems like none of the members have an opportunity to share. Pastors are not the only people that God chooses to speak through, so why are they the only ones we usually hear from? Churches that allow members to share messages and participate in different ways are, in my opinion, opening up the lines of communication from the Holy Spirit in many more ways than churches whose members remain silent and always defer to the pastors. Of course, that may be the exact reason those churches limit speaking duties to the pastor; they may be afraid of what might happen if they give up control and let the Holy Spirit work. I think at the very least, church members should be encouraged to bring messages that they feel are from the Spirit to the pastor or elders, who can discern whether the message edifies or exhorts the church in some way and then pass it along or allow them to share it if it seems beneficial. But that is obviously a discussion for another time…back to our experience at Hamilton Life Church. We worshiped the Lord with two worship songs that were led by a full band with drums, bass, electric guitar, and keyboard. You might say that was the end of what I would call a “normal” church service. What happened next was something I had never seen in church before. After worship, three ladies came busting through a side door at the front of the sanctuary dressed in homemade superhero costumes that were nearly blinding from the bright neon colors, glitter, and shiny fabric. 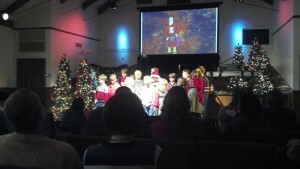 The ladies put on a skit directed at the children in the congregation which illustrated the real “Spirit” of Christmas. They went through various scenes that dramatized the typical American over-indulgence that comes along with the holidays…shopping, toys, food, candy, parties, and the gross materialism and consumerism that distracts so many from drinking in the joy and peace of our Lord Jesus Christ as we celebrate His birth. The ladies were nothing less than hilarious and were absolutely fearless in putting themselves in front of the entire congregation in ridiculous outfits so that they could connect with the children in a unique and fun way. After the skit, pastor Damon oversaw a hysterical race between several of the kids and their parents. It was the kind of game that is usually reserved for church camp, or a church retreat, or a fun activity in the fellowship hall…anywhere other than the middle aisle of the sanctuary during Sunday service. But that is the type of congregation Hamilton Life Church seemed to be. A fun-loving, family-oriented group that comes together in the church like it is a second home they all share, as opposed to a stuffy, rigid crystal cathedral. The game that they played required the kids and parents to race from the front of the sanctuary to the back and grab a stuffed animal out of a basket and then run back to the front and stuff it in a big Christmas stocking. The first team to fill their stocking with stuffed animals was the winner (the deck was stacked in the kids’ favor…the stocking the parents had to use was HUGE). As soon as the pastor said “go” it was pure pandemonium. 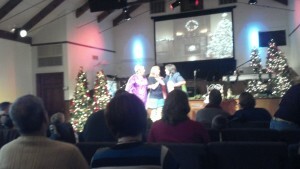 It was the most fun I have ever seen people have in church. People were cheering, laughing, jumping around, and having a blast…imagine that. After the chaos of the stuffed animal race subsided, the children’s choir came to the front and sang a few songs. 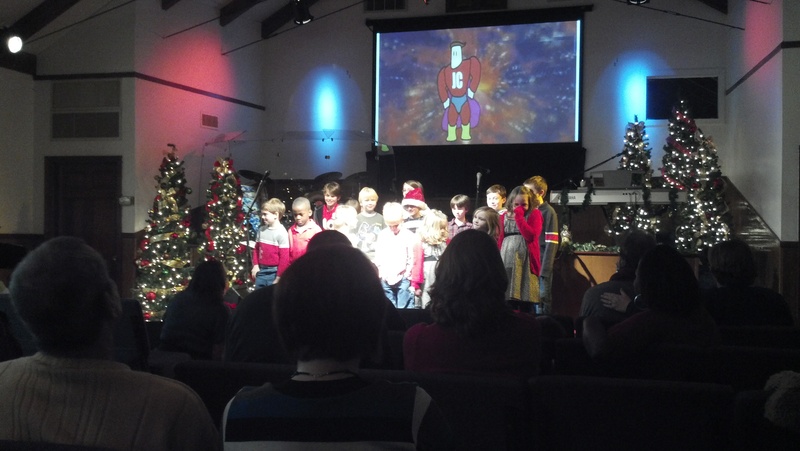 As you can always expect when watching a children’s choir in church, it was a heartwarming, cute, and funny performance. When the singing was over, the children passed out Little Debbie cakes to the congregation and then put on a skit of their own that dealt with the wrong kind of Christmas attitude in a retail setting, which can definitely bring out the worst in people. After the children finished their segment, we were shown a video from The Skit Guys and then pastor Damon came to the front to give a sermon. He spoke about joy, peace, and hope, and noted that joy is a journey and not a destination, using Romans 15:13 as a Scripture reference to encourage the congregation. Nothing against pastor Damon’s sermon, but after being a part of the church service we had just experienced, preaching on joy should have been really, really easy. It was all around us. The people of Hamilton Life Church were full of it. They seemed like a big, joyful family. Laura and I left feeling like we had gotten a little bit of everything during our visit…sincere worship, fun and games, a powerful message, fellowship, and good conversation. The experience that morning made me think that a lot of times we hear things at church that we do not also see or feel. Do you ever sense that? You hear a message on joy, but when you look around everyone seems cold. You hear a message on hope, but everyone looks lifeless. You hear a message on peace, but people act haughty towards you. How much more impactful is it when you hear and feel a message. When you see the people around you living and bearing the fruit of a message outwardly, then it really adds another element to the words a pastor speaks. Herbert Hoover said “words without action are the assassins of idealism”, and very similarly to that, I believe church sermons without action are the assassins of faith. My takeaway from Hamilton Life Church is that no matter what I see around me or no matter how others may perceive me, I need to visibly display the peace, hope, and joy that I have in my heart as a result of my faith in God’s promises and His gift of salvation through Jesus Christ. If other people can’t see it in me, how will I ever prove with words that it is actually there? My Lord deserves more than just lip service! Hamilton Life is a AWESOME church. Loved your article. Wow! What an awesome testimony that HLC is doing what God called all of His church to do… share his love with all!